I’m taking care of my neighbor’s leopard gecko this weekend. 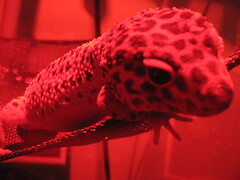 She (the gecko, not the neighbor) lives in a large glass tank lit by a red heat lamp, and eats live crickets which are kept in a separate container. This means I have to pick a cricket by hand out of the swarm, shake it in a container of calcium supplement powder, drop it into the gecko’s tank and watch her stalk and pounce, then repeat the process two or three times until she’s full. The crickets themselves have to be fed orange cubes, else they begin eating each other. That’s right: you have to feed the food or else it starts eating itself. 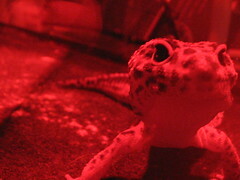 More on Leopard Geckos here. She’s a cute gecko, and readily crawls onto your hand when invited, and even gives you a little lick, but I think I still prefer my cat. Ick. And I thought our African Pygmy Hedgehog was a lot of trouble.